The one of the latest buzzwords in fitness and weight loss circles is High Intensity Interval Training or HIIT. This method of exercise has the potential to allow an exerciser to lose weight faster that any other form of "aerobic" exercise. Although interval training is not a new concept in the field of sports conditioning, it has recently become a popular exercise form for general conditioning and weight loss. This article provides some basic information on HIIT and explains why this form of exercise is so effective for weight loss. To fully understand the many benefits of HIIT it is important to first understand some basic physics and the concept of power. Generally speaking, power is a measure of the ability to perform work per unit time (Work/time). Work is defined as the amount of force required to move an object a certain distance (Force x Distance). So power is defined by the following formula: Power = Force x Distance/time. If you recall that velocity (speed) is equal to distance divided by time (Distance/time), then it is easy to see that power is actually a measure of how fast you generate force. Obviously from the previous explanation, it should be clear that the amount of energy required to perform a task is directly dependent on the power required to do so. So if we now apply this concept specifically to human exercise, we recognize that muscles use chemical energy produced from the food we eat to generate power. Consider the muscle power required to walk 3 miles per hour and that required to run at 11 miles per hour. The muscle power required in each example is strictly dependent on the speed since the force (body weight) being moved changes very little and essentially remains constant (assuming sufficient hydration). It is possible however to regulate power output by other variables other than speed by manipulating the amount of force (wearing a weighted vest) or increasing the resistance to movement like increasing the gradient of a treadmill or running up hills. HIIT involves performing bouts of high intensity running (1-3 minutes) separated by recovery periods of walking for about the 2-3 times the duration of the running bout. The work: recovery ratio should therefore be 1:2 or 1:3. The intensity of the running portion should be near your VO2 max (maximal oxygen uptake). Since most casual exercisers and those looking to lose weight rarely know their VO2 max, is may be helpful to use a perceived effort scale of 1-10 to regulate intensity; with 1 representing no effort, and 10 representing absolute maximal effort. Aim for about 8-9 on the effort scale. Note that HIIT describes what it is - HIGH Intensity Interval Training so before you begin such a regime it is advisable to have yourself cleared by a physician. How do I begin HIIT? There are no hard and fast rules to HIIT other than those mentioned above, so this article will not aim to provide a strict program of exact times and durations. 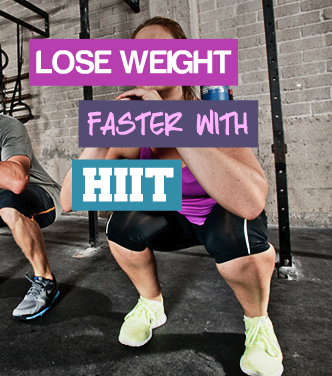 The basic principle of HIIT is to manipulate intensity to increase power output and accelerate weight loss. Initially if you are just beginning HIIT, your work sessions may be much shorter than 2-4 minutes - work your way from whatever you can handle to the goal duration. As you become more conditioned, you may also start to increase the intensity of the sessions by aiming for the higher end of the perceived effort scale or reducing the recovery walking periods or both. If you plan on exercising on a treadmill or elliptical machine, an excellent way to perform HIIT is to choose an intense interval or hill program. If you prefer to get the session over quickly as possible (like me), you can manually adjust the speed and incline randomly depending on your perception of effort. If you are sadistically self-destructive however, you may try "running the hills and walking the flats" on a treadmill - this will greatly increase your power output and energy expenditure. Experiment with these techniques of manipulating the intensity of your workout and depending on your level of fitness (or patience! ), the entire interval training session should last from about 10-20 minutes in duration. How does HIIT allow for faster weight loss than traditional "aerobic exercise"? HIIT is a big "bang for the buck" exercise modality compared to traditional extended duration aerobic exercise like walking, jogging and running. Walking requires a relatively low power output and high speed running simply cannot be sustained for very long periods of time. The great benefit of HIIT is that the low intensity walking bouts that separate the high intensity bouts allow for a much greater power output and caloric expenditure, providing much more "value for time". Depending on the intensity of the session, it may be possible to burn the same number of calories in a HIIT session as a walking/cycling session many times longer in duration. HIIT helps avoid the muscle wasting effects associated with continuous low intensity exercise such as jogging and walking. So HIIT helps spare valuable lean muscle mass which is a key determinant of your RMR or Resting Metabolic Rate. Simply put, a higher muscle mass will cause you to expend more energy even while you sleep! The technical term for this muscle wasting effect is "protein sloughing", caused by extended periods of elevated cortisol levels. Cortisol is a hormone released from the adrenal gland during all forms of stress including exercise. Although cortisol is crucial for a person to adapt to stressful stimuli, a negative side-effect is its direct muscle wasting effect. Cortisol stimulates muscle protein breakdown in order to increase the amount of free amino acids (protein building blocks) in the blood. The majority of these amino acids are used for the remanufacturing of glucose (gluconeogenesis) in the liver to maintain blood sugar levels. While some personal trainers and exercise physiologists may argue that the increased exercise intensity (stress) of HIIT causes a higher increase in cortisol, the important factor to remember is that the duration that the hormone levels remains elevated is significantly shorter than in extended lower intensity aerobic exercise. How can I lose fat when I'm burning mostly carbohydrates with HIIT? Remember even though HIIT is a high intensity form exercise, relying heavily on the metabolism of carbohydrate, weight loss is determined by energy balance. In other words, if on a daily basis you consume less energy than you expend, you will lose weight regardless of the "primary fuel source" of your exercise bout. An HIIT session that decreases your carbohydrate stores (muscle and liver glycogen) simply means that more calories from subsequent meals will be will be directed toward replenishing glycogen stores, and less will be directed toward fat storage. It is only after glycogen stores have been replenished that excess calories can be directed toward the manufacturing and storage of fat. Also, caloric expenditure continues for several hours after a bout of high intensity exercise, as energy is required in the recovery process. In conclusion, this article has explained and highlighted the benefits associated with the use of HIIT for weight loss. Other benefits such as faster fitness improvements and immune system maintenance associated with HIIT have not been covered in this article, but may be discussed in future articles on our site. Clearly if the goal is to lose weight fast and boost metabolism by sparing muscle, then HIIT is the ideal form of exercise. NOTE: You're free to republish this article on your website, in your newsletter, in your e-book or in other publications provided the article is reproduced in its entirety, including this note, author information and all LIVE website links as above.